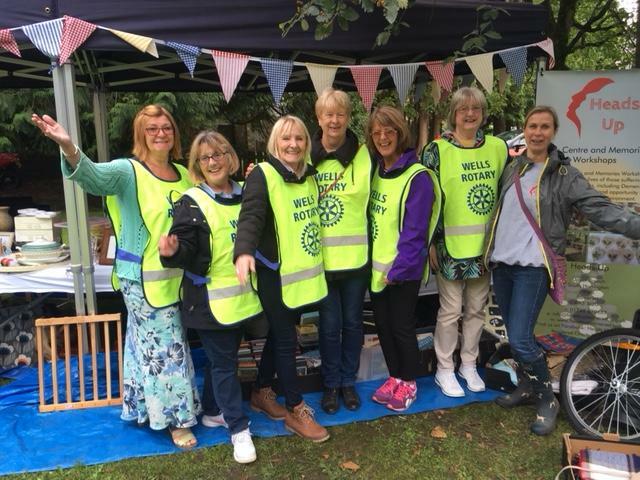 The wet start to the day did not deter Wells Rotarians from erecting and manning a 'pop-up shop' at the Recreation Ground. The regular teams of Rotarians provided a venue for and raised money for Wells's local Heads Up charity. A wide range of 'previously loved' items were united with new owners and Heads Up benefited from the sale and the publicity of the occasion. Rotary in Wells aims to hold a pop-up shop every three or four months, to raise money for one of its charities and suitable donations can be left with the club in advance. The club fielded a team for a pop-up shop in early December to help to fund the opportunity for a young person to develop their confidence and leadership skills, via a weekend on Exmoor in the late winter - let us hope for clement weather!